Four-fifths of China's population is devoted to manual labor. Perhaps the only factor which permits China to combine in a commercial way with the rest of the world is its cheapness of labor. It has been repeated said that the cheapest and most abundant thing in the country is human life. The common man of the farm or of the city is the coolie, properly called "k’u li" or better, "strength". When we reflect that 80 percent of China's vast population is forced to labor hard, barehanded, for a mere physical existence, we can begin to grasp the significance of its industrial situation. No modern inventions; no machines have come to set it free. Like Edwin Markham's "Man with the Hoe", the Chinese worker feels the weight of centuries of toil upon his shoulders. Chinaware! What does the word connote? It is simply a ware made of clay and named for the country that first produced it. Whether it be a green tile from a temple roof, a dish, a vase, or a painted ornament from a wealthy Celestial's home, it all has a traceable connection with Jingdezhen. 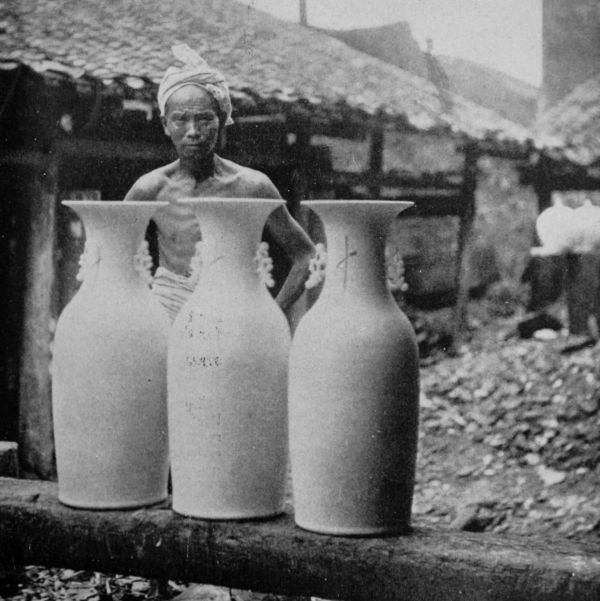 With the Chinese, Jingdezhen and porcelain are synonymous. Traveling by a small and rickety steam launch, which was completely covered with a cargo of human freight, we left Nanchang, passed down the Kan River and out across the lake. It was 8 o'clock on a June morning and the thermometer registered 90 degrees. Fortunately, we were running at half speed, and after violently churning up the mud, we were able to back off and strike a new course, sounding our way until we entered the mouth of the river leading to Raochow [Jaochow, today 'Shangrao'], the most important city on the lake. At Raochow [Jaochow] our house-boat experience began. With the assistance of the water police captain, we at once transferred to a small but comfortable boat. It was not, however, until after nearly an hour's delay, due to the necessity of purchasing some eggs, vegetables and charcoal for the journey, that we started upstream against a swiftly running current, just as the stars came out. The police captain had been informed by wire of our coming and was waiting for us with a guard. 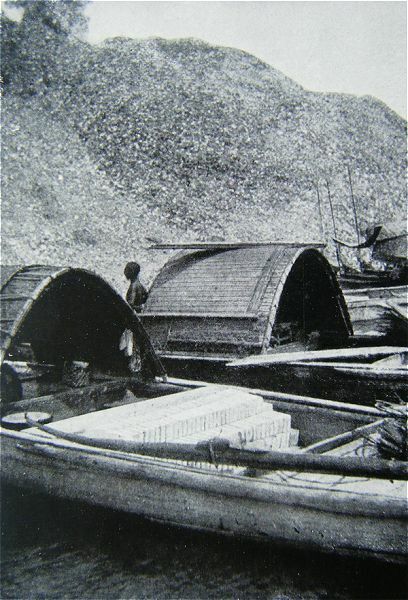 These guards are stationed at intervals along the river in "p’ao Ch’uan" or gunboats, and are supposed to help in the collection of the revenue tax and to protect travelers from bandits. The craft itself was about 40 feet long and was divided into three sections, with space in each for two "p’u kais" or mattresses. 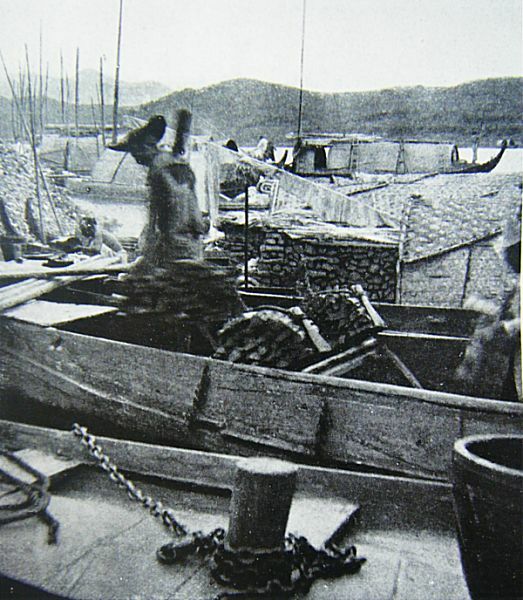 In the stern, covered with boards, was a charcoal stove, with an ample supply of rice nearby. 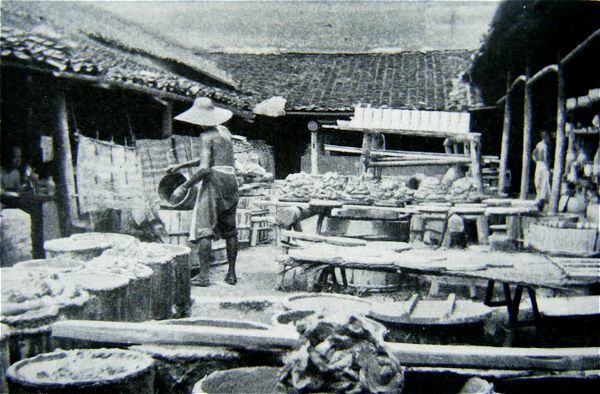 The principal articles of food were eggs, rice, fish, several kinds of vegetables, and tea – good, substantial food when one is living in the open. By removing the floor and standing on the bottom of the boat, one could assume an erect position with ease. Of jets and flashes of red fire." The most unusual feature of the City of Porcelain is its conservatism. "Bu k’ai t’ung" (not open to communications) is heard on every hand. 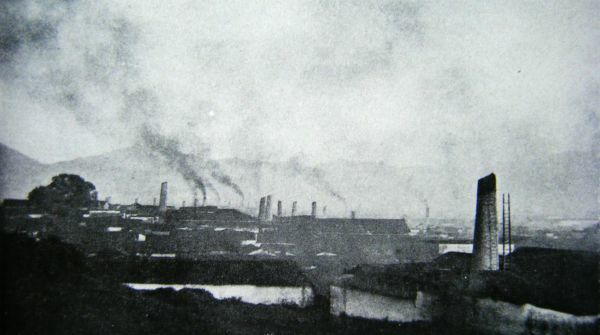 Although China is home to the printing-press, there is not a single newspaper, daily or weekly, published in this city of more than a quarter of a million inhabitants. The reason given for this unprogressive state of affairs is that the magistrates have always opposed the press, on the one hand because they are afraid of its political influence, and on the other because of the financial support that would be involved. 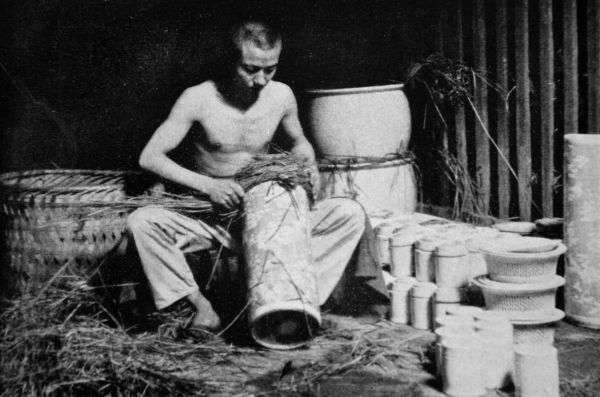 Two very descriptive words are used by the Chinese in referring to the composition of porcelain – "c’hi ku", or porcelain bone and "c’hi ro", or porcelain flesh. The former gives strength and brittleness to a vase or bowl, while the latter adds resiliency and toughness. Unless these clays are mixed in the right proportions, the vessels will either sag or crack when placed in the furnace. Technically, the "bone" clay is kaolin, or China clay. It is an infusible substance derived from decomposed feldspar or granite. The "flesh" clay is a white, fusible material formed from a mixture of feldspar and quartz. 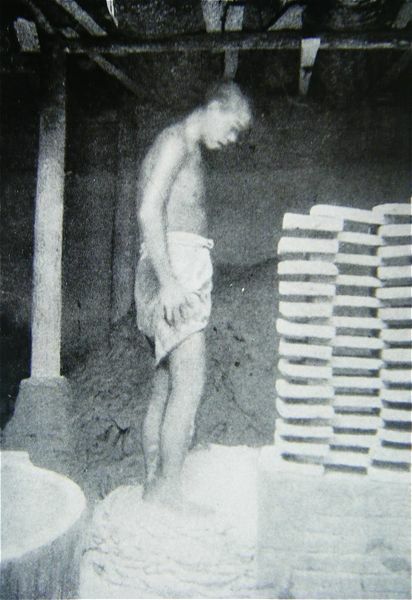 After the clays are thoroughly cleansed, sifted and refined, they are kneaded together in varying proportions, usually by a bare-footed boy, until they are ready for the potter. The wet lump of clay is then placed on the knob of the potter's wheel. 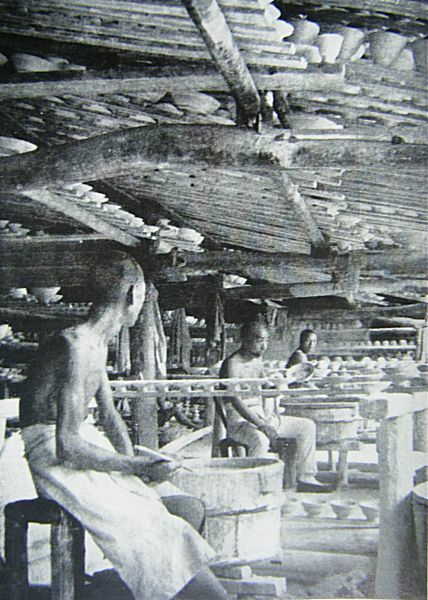 The potter's wheel, which was invented by the Chinese, is a huge circular machine, about four feet in diameter, made of heavy timbers to lend it momentum. It rests on a perpendicular axis in a slight depression or pit, into which water and debris rapidly drain. 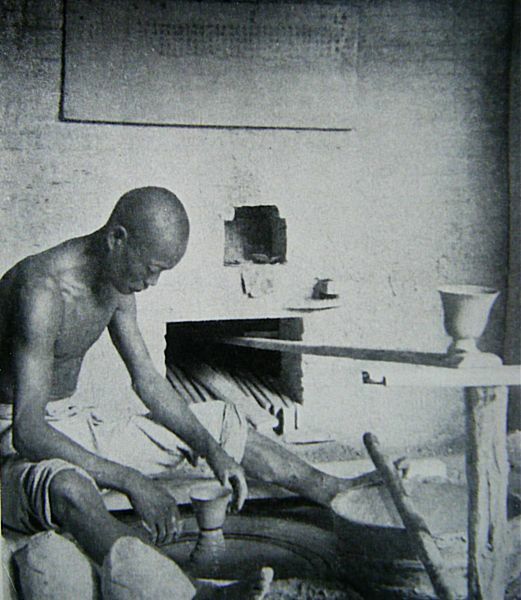 The potter is perched above the wheel, with one foot on either side, in order to allow sufficient space for the movement of his hands. After revolving the wheel swiftly with a short pole, he deftly and with mechanical precision fashions a plate, bowl or vase. After years of practice, he can estimate to within a hair's breadth the proper size. Note the thousands of pieces stored overhead, all awaiting the under-glaze decoration. 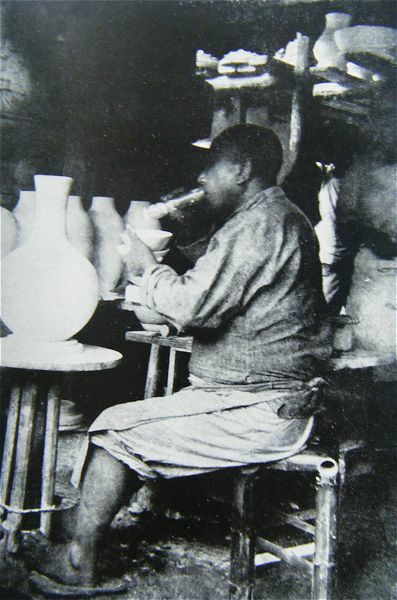 After being decorated, the glaze is applied in one of several ways - by dipping, by being blown on through a tube, or by sprinkling. The piece is then ready for the furnace. In the center of the porcelain industry the product is classified according to shape, as follows: "Yuan c'hi", "tso c'hi" and "tiao hsiang" - round ware (cups, bowls, saucers, and plates), irregular rounds (teapots, vases, etc. ), and irregulars (statues, trees, etc.). The factories are likewise classified according to the shape of the ware they manufacture. 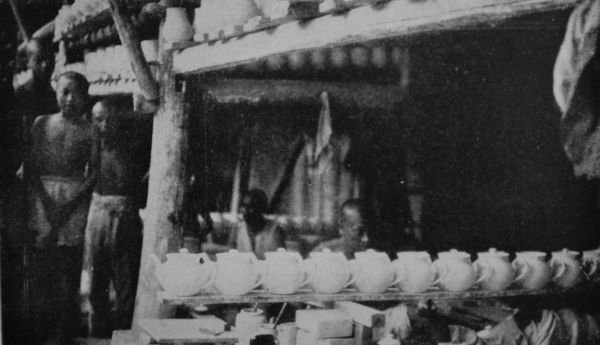 We found porcelain to be classified, according to shape, as follows: "yuan c’hi" or round ware, which includes cups, bowls, saucers and plates; "tso c’hi" or irregular rounds, including teapots, vases, and small, flat ink and paint boxes; "tiao hsiang", or irregulars, such as images, statues, representations of trees and other objects. 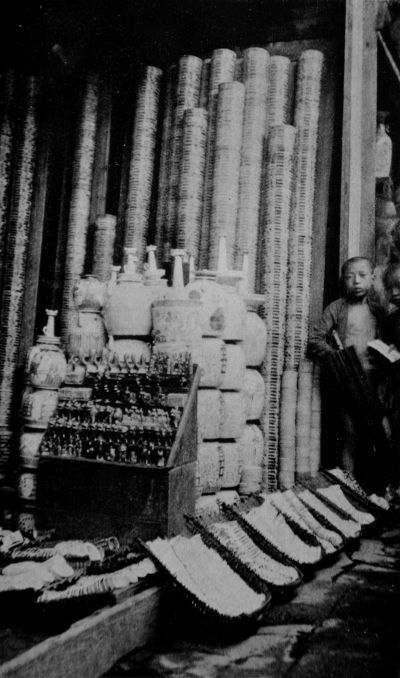 Although the empire no longer exists, porcelain is still used in large quantities by officials in Peking. 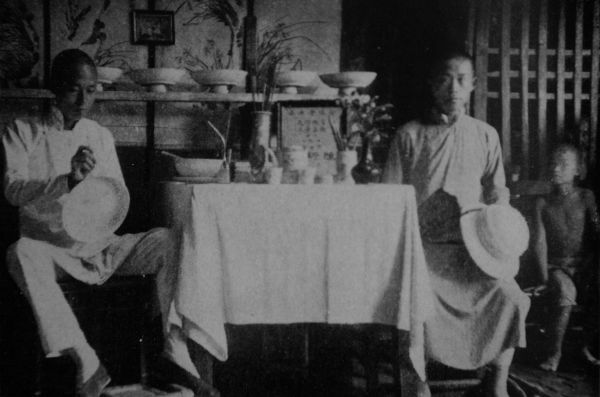 It was my pleasure on several occasions to meet at feasts President Hsu His Chang's representative [Xu Shichang, President of China (1918–1922)], who had been in Jingdezhen for several months purchasing special wares to be used as gifts in the capital. We visited the factory which filled his orders and saw there dozens of vases, in every stage of development, later to be presented to foreign ambassadors and Mongol princes. Wages range from ten cents to one dollar per day, Mexican, for potters and molders. This includes food and room. The artist's wage ranges from twelve cents to three dollars per day, varying not according to the number of hours but, but according to he number and quality of the pieces produced. But no artisan must work too long. If a man is found doing too much and working beyond the time limit, he is set upon by his fellow workers and severely beaten. We learned from the revenue collector that about $5,000,000 worth of porcelain and pottery is shipped out of Jingdezhen every year. 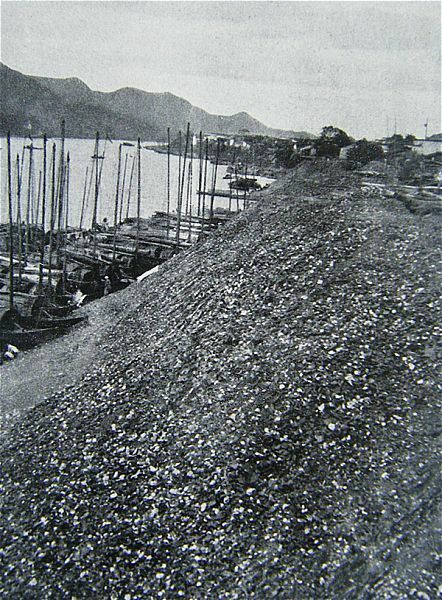 Every piece has to be hauled down the river in small boats to Raochow [Jaochow, today 'Shangrao'], whence it is forwarded in large junks to Shanghai and other cities. Most of this is for domestic use, the Chinese not yet having learned the value of stimulating international trade. Patient skill and no small amount of time are required in making this pattern, which is known in Jingdezhen as "Ling lung" [devils' work]. 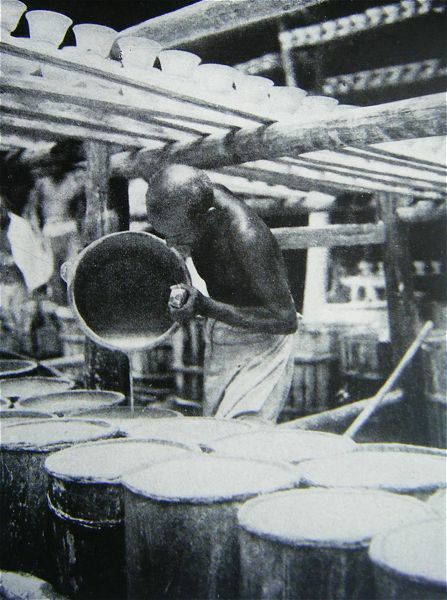 It is made not by pressing kernels of the grain into the wet clay, but by cutting the apertures with a sharp knife, after which the holes are filled by repeatedly dipping into the glazing fluid. Perhaps the most popular design of porcelain with foreigners is the "ling lung" or rice pattern found in dishes, cups and bowls. The Chinese have learned the art of producing foreign-style dinner sets in this pattern and are finding a ready market for them. Patient skill and no small amount of time are required for the making of rice pattern. The wet clay is first formed into a crude cup or plate on the potter's wheel. After the piece has dried for several hours or for a day, it is carefully scraped with a special kind of knife which conforms to the curvature of the vessel. The next step is to cut in the kernel-shaped holes. This is done by a skilled workman, who uses a small, flexible steel lancet.